Went there this morning - was CLOSED. Doesn't look like reopening. 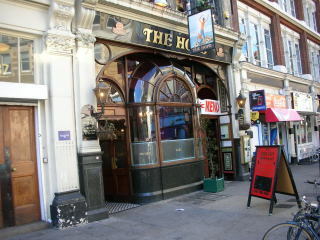 Rolled in here at 630am for a swift pint after a ramble round nearby Smithfield meat market. Interesting Victorian décor and high ceiling, a few white-coated porters having a drink after their early morning shift. Place has seen better days obviously but that isn't the point - these places deserve a visit for rarity and atmosphere alone. Currently £3.90 Fosters. 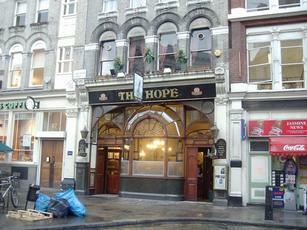 The Hope did the trick and ticks the box as an old skool London boozer. You wouldn't go there for a night out but it's a good daytime pub. Three handpumps with Youngs ordinary and two others I can't remember. The pint was good and met a few workers that morning who bought me a shot of tequila at 10:00 am. Nice place to rub elbows though not at all fancy. It is always good to be able to get a beer in the morning after a long flight from the States.